DAMASCUS, July 8 (Xinhua) -- Huzaifa and Sara, a four-year-old boy and a three-year-old girl, were both born deaf and have never heard the loving voice of their Syrian parents, chirping of birds or the melody of music. For their parents, the only dream in life is to see their beloved angles being able to speak and hear the life around them like other normal kids. The two Syrian kids are lucky that they received aid from Aamal, a charity organization that cares for people with disabilities, including kids with hearing impairment and other problems. While Aamal finds it too costly to cover the surgeries, such as cochlear implants, for Huzaifa and Sara, the Chinese embassy in Damascus stepped in to give a hand. The embassy covered the costs of two cochlear implants' surgeries for Huzaifa and Sara in addition to the rehabilitation process that ensues. The Chinese donation for Aamal also includes the educational expenses of 100 children with disabilities for one year. 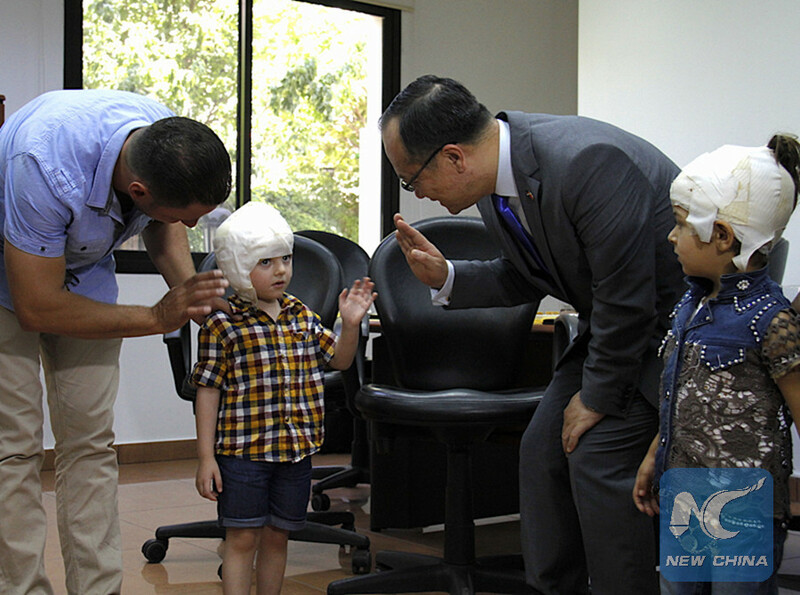 In the Aamal building, Chinese Ambassador to Syria Qi Qianjin on Thursday met Huzaifa and Sara along with their parents after the kids received successful cochlear implants recently. The kids' heads were all wrapped in bandages, but they kept smiling as their parents tickled their little tummies. A couple of weeks later, the two kids will have hearing aid devices and then they should be able to start hearing sounds and voices. Huzaifa's father, Jaber, told Xinhua that his kid has received the opportunity of a new life with the hearing implant. "He was given the opportunity of a new life and I want to thank the Chinese embassy for this assistance," he said. For her part, Iman, mother of Sara, told Xinhua that her daughter should soon be able to hear for the first time. "She has received the cochlear implant and in 20 days, she will have the hearing device so she should be able to hear soon. I really wish to see her speaking and hearing and I wish to thank China from the bottom of my heart," she said. 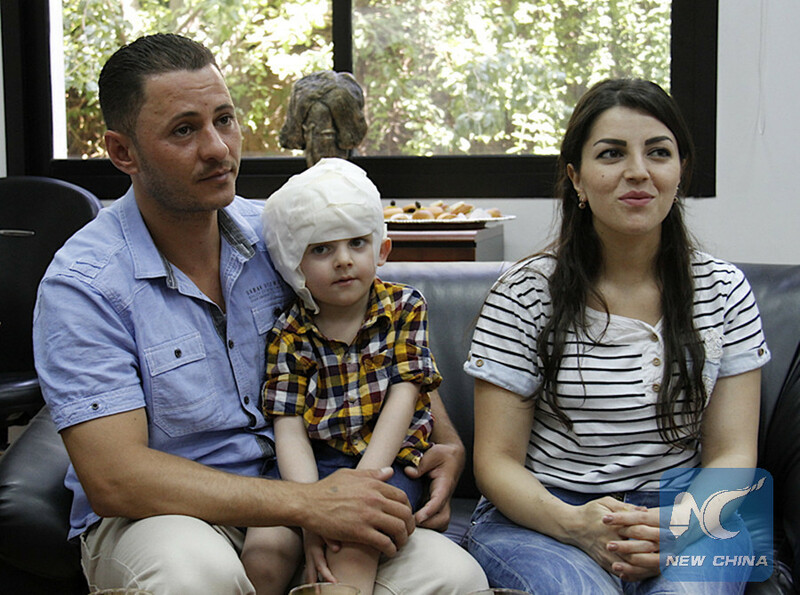 Meanwhile, Claudia Touma, executive director of Aamal, told Xinhua that the Chinese embassy in Damascus has cooperated with Aamal in the cochlear implants program for the kids who are unable to hear with traditional hearing aid devices alone. "The Chinese embassy covered the cochlear implants for the two children, and this is extremely important for the lives of these children and what they did has a very big positive impact on the lives of these kids," she said. "We very much appreciate the Chinese embassy for the donation they offered and we expect that this cooperation would continue and when the kids would start to hear and talk, they would appreciate their good deed even more," she said. For his part, the Chinese ambassador said there is room for further assistance and cooperation in the future, particularly for the children. "The Chinese embassy has offered a simple donation for this center to help these kids and I think that in addition to the assistance for this center, we have more projects to increase and reinforce the relationship with the Syrian people," Qi said. The ambassador has underlined the need to provide humanitarian assistance to the Syrian people during the time of war. "In the future, we will offer more assistance for the Syrian people, especially the children," he said. The Chinese embassy has been active to offer assistance for humanitarian purposes in Syria to help alleviate the suffering of the Syrian people, including making donations to humanitarian and charity organizations.